Adopted on September 11th of 2014, the design of the flag of Norfolk dates back to the 12th Century and the first Earl of Norfolk, Ralph de Gael. 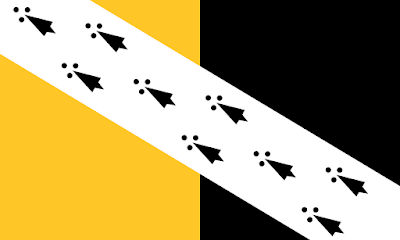 Probably the most interesting thing about this flag is the band that run along the diagonal: ermine is a local symbol and it also might be a reference to Brittany where Ralph was Lord of Gael- the Ermine also features on the Breton flag. The Breton connections of the flag are interesting to me- Cornwall has a more direct connection to their flag, and is geographically closer- but to see tendrils of Breton symbols make their up to Norfolk is interesting from a geographic and maybe even a culture point of view- but probably not from a historical point of view when you consider the centuries long mess between England and France. How do you get there? Well, find London, head straight north until you hit Peterborourgh. Keep going north a bit and you're pretty much there. It more or less sit between Hull and Peterborough and is northwest across The Wash from Norfolk. So, let's talk about their flag! I like this flag, actually because we have a little bit to talk about when it comes to it. So many other county flags out there are historical in nature, so I'm stuck saying 'well, it's historical' and not much else. More contemporary designs usually have more of an explanation behind them and Lincolnshire, happily is no exception. It was adopted on October 24th, 2005. The red cross in the center is St. George's Cross, which stands for England. Yellow in the flag stands for the crops grown in the county as well as the somewhat unfortunate nickname for the residents of said county 'yellowbellies.' The fleur-de-lys in the center is a symbol of the city of Lincoln. The blue stands for the sea on the east coast as the skies of Lincolnshire. The green stands for the rich lush fields of the fenlands. 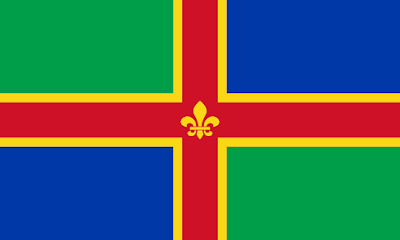 So, there you have it: Norfolk and Lincolnshire... until next time, keep your flags flying- FREAK or otherwise!